This was the wip photo I took of the Christmas gifts I gave the kids' teachers this year. Are you tired of my trees already? I just loved making them! The leaves equal the number of children in each class. I made two more for very dear friends and they were all framed. I forgot to take pictures of the finalized projects! :( I'm thinking I may make a couple more and sell them on my site, which by the way, is closed until February. I want to revamp and start fresh. I was supposed to work on new designs in December but it never happened. 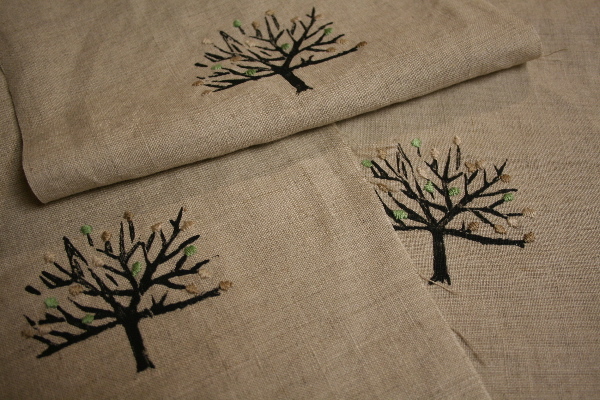 This block print/embroidery type of project is going to be my "thing" this year. I can feel it. Now if I can only find a name for it. What would you call this type of crafty illustration thing? I said good bye to my Am Intrigued blog. It was time to do it. One of my main goals this year is to lighten my load and clear the clutter everywhere. In December I worked on my bedroom and the kids' rooms. I took many bags to Goodwill, donated books to the library and threw out a bunch of junk. It felt GOOD! One blog down and bedrooms done...now to organize the garage and my office! Yikes! Those are beautiful...what a nice gift! I'm in the process of purging toys and stuff and making room..for what? I don't know. I think I'll just enjoy the space! I think your trees are pretty and cool! Keep up the good work.